Hello all! I am new on this forum but found it whilst googling for information about the Inca Tech Claymore amplifier. I have owned one of these amps since the early 1990's, when I bought it off a photographer at my then workplace for the princely sum of £60!! Since then it has given me many years of faithful service with no problems. I now live over in SW France and the Claymore is powering some Mission 731 speakers on Gale stands. These were a Richer Sounds purchase back in the day. Some of my stuff is still back in the UK including the manual for the Claymore (in a box in the loft!!). I have been trying to find out the specifications for the Claymore and specifically what ohm speakers can be used with the amp? I have always been pretty happy with the combination of Claymore and Mission 731 speakers, however the lounge where the system is in our French home is 42 sq metres. The other day we were out a a Vide Grenier Village (literally Village Barn Sale) in which many households have a clear out! I came across a pair of Dual CL 160 speakers in mint condition and made a impulse purchase, mainly based upon their fab retro 70's appearance of wood veneer cabinets and aluminium grilles. Seems they are of 1974-75 vintage, but are in amazing well cared for condition. Only paid €45 for the pair so not much to lose! Seems they cost around 368 Deutsche Marks in 1974-75, which equates to about £147 at the time..so not cheap! Haven't been able to find that much information on them on the web? Anyway, I connected them up to the Claymore and they sound very good, much bassier than the Missions, but this is no surprise given their much greater size and the larger 10" woofer. However I have realised that they are 4 ohm speakers and I have a sneaking suspicion that the Claymore is 8 ohms? Can anyone confirm this and do you see any issues for the Claymore in driving these speakers? Don't want to risk damaging it! Also any thoughts on the speakers themselves? The Claymore is designed to give 50W/8Ohm and it will provide into 4Ohm about 80W it may get a bit warmer but it should be no problem. Colin, who designed the Claymore will obviously best placed to answer your question. He pops in here a couple of times a week, so I'm sure he'll let you know. Personally, I'd be surprised if the Claymore would suffer from driving 4ohm speakers. The output may change somewhat in response to different impedences, again Colin will have the details on this. I wonder how well the rubber surrounds have lasted. Wow... thank you for your replies Colin and Docfoster!! Great to hear from the original designer of the amp that running these should present no problems. The Duals certainly sound great and the rubbers around the woofers look fine to my untrained eye. Don't think these have had much use over the years? Have read somewhere that you can upgrade the capacitors in the crossover within the speakers? I have also read that the Claymore amp could be in need of some work due to it's age? Possibly new capacitors? Col,you doing upgrades on Claymores? Oh yes done a few in the last few weeks. BTW... I forgot to mention, I have a Claymore in a 2nd system driving some big old 6ohm Whardales 3 ways. It certainly doesn't struggle with those. I always want to share in some Colin-praise. He's an absolutely A1 designer and a top top human being. It pulls the whole system together sonically. Love the look of the Duals. Not been on here for a while. You may remember I picked up some 4 ohm Dual CL 160 vintage German made speakers at a car boot sale in rural France where I live a few months back. 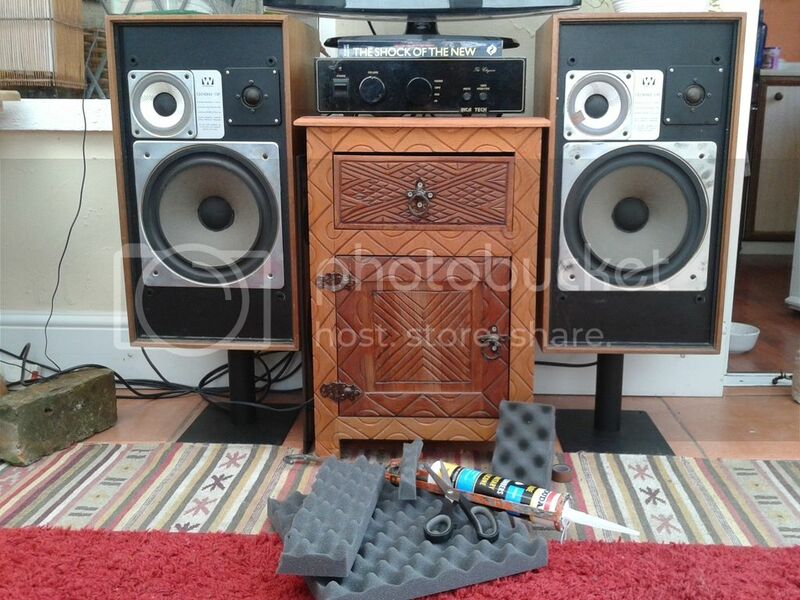 The speakers are currently paired with my trusty Incatech Claymore amp which I have owned for many years. Unfortunately, I have had a recent problem with the Dual speakers (possibly due to their age) and put some music on yesterday and the speakers sounded awful. Really dull, flat and like they were not being driven. At first I suspected the amp so I got out my old Misson 731 speakers and connected them up to the Claymore and all was fine again sound wise. Decided to remove the backs from the Duals and have a look inside. All the wiring appears fine and all the soldered connections look okay. I then connected them up again And by accident I noticed that with the front grilles removed if I applied pressure to one of the four tweeters then the speaker started working correctly again?? By putting light finger pressure on the edge of the tweeter suddenly the rest started working and the bass cone was being driven again. It was the same issue on both speakers with the top left tweeter ( of four) being the culprit on both speakers. Not sure what the problem is but one speaker has started working fine again but the other has now stopped working correctly even if pressure is applied to the tweeter? Any thoughts? Seems a real shame as these 4 ohm speakers give a tremendous sound being driven by the 8ohm Claymore. I guess there is no way I would get spares for a 1974 speaker? Can you source a wiring diagram for the Duals? The crossover network is of most interest. Would help in diagnosis. Now there's a challenge!! I will hunt the internet for said info! Not doing very well with the search!! Spent a good hour with google looking for a wiring diagram, but to no avail. Will I have to write these off? Seems a shame, they were working perfectly! Must be a simple fix? I read somewhere that a guy had replaced the capacitors on the crossovers and had improved the speaker performance drastically.